We’ve had plenty of courtroom reports from Alberto Contador and Jeannie Longo. Riccardo Ricco got a criminal record and a prison sentence. Operation Puerto is being reheated too. All in one week and it’s not yet Friday. Don’t forget the tale of a breakaway league where some of the big teams in the sport are thinking of setting up on a new version of pro cycling. But it goes without saying the sport is about a lot more than lawyers and bankers. 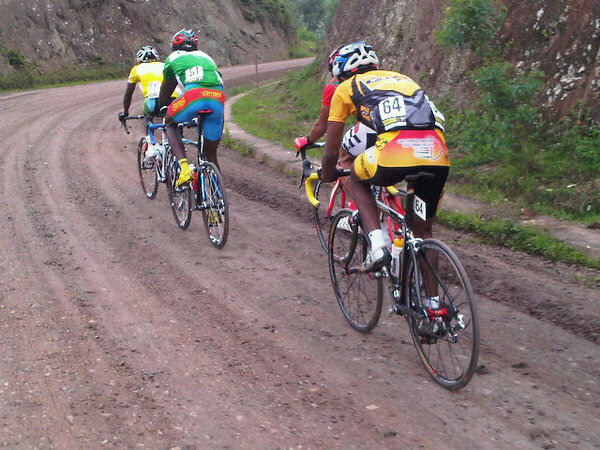 There’s no better example than the Tour of Rwanda. The African country is recovering from a civil war than saw an estimated 800,000 people slaughtered and by some accounts, the place is doing well all things considered, the GDP per capita has tripled since the genocide, albeit from a small base. It’s a hilly country full of coffee plantations where the roads swing from 1,000 metres above sea level up to heights well beyond 2,000 metres. One star of the race is Adrien Niyonshuti. A Rwandan, he is a pro with the South African UCI Continental team MTN. Whilst the public has been with him, perhaps luck has not. Cyclingnews.com reports “a seriously scraped knee and a dislocated shoulder which deprived of wearing the polka-dot jersey on the podium, all due to a crash the day before when he came back to his hotel“. A dislocated shoulder? French daily L’Equipe has dispatched a journalist to cover the race. Philippe Le Gars is not one of the usual cycling staff, instead he writing about the race from other perspectives and his daily chronique is a must read for me at the moment (remember translation engines do a pretty good job these days). His latest despatch features Tanzania’s Richard Laizer who normally works as a bicycle courier in Arusha where each July he likes to tune into the Tour de France in between delivering messages so that can can watch his hero Mark Cavendish in action. Le Gars also reports how riders turned up for this UCI 2.2 race with their bikes held together by tape, although they are decked in Google jerseys thanks to Hincapie Sports. Yesterday we heard about the Ethiopian cycling team. The country is a neighbour of Eritrea which has a flourishing cycling culture, a legacy of Italian colonial rule but which today means Daniel Teklahaimanot will ride in the Pro Tour in 2012, assuming Greenedge makes it. In fact Ethiopia are at war with Eritrea and the cycling team has being funded to help the rivalry. But things are more inspiring on the bike of course. Ethiopia’s Weldemikael Weyo made the winning breakaway and was only beaten after being outfoxed by a more experienced Team Type 1 rider, the American Kiel Reijnen. Weyo lacked what is known as science de la course or tactics but with these abilities, hopefully there is more to come. This race is more than a sporting competition or a competitive ride. The tales of riders travelling by bus for days just to take part are inspiring, the home-made repairs and often unsurfaced roads are reminiscent of how sport could have been a century ago. Above all this race is a useful reminder that cycling is a struggle but in the positive sense. Battles are fought on the road and not in the courtroom. Thank you ..again.. for a most interesting, informative article. Great article! What an inspiration that race is! Hats of to all the riders who virtually have nothing, but somehow make means. I met Adrien Nyonshuti a month ago and he’s a real great guy. Really enjoy reading about stuff like this. Especially hearing how cycling races are done and stories to be told in Africa. I’m keen to hear more of how these races pan out. A very inspiring story on this Thanksgiving day in the States. In the times of unprecedented greed, this is what we all need to make sure we are touching the ground while walking. Thanks again too. I’m impressed by the stories and by the way more and more people are enjoying cycling. Kind of a reminder of post-war cycling in Europe – horrible roads, marginal equipment, etc. Those were the days when the legends were made. The struggle and hardship were the story that made cycling interesting. Too bad so much of that’s been lost these days when the riders arrive in a luxury bus, their bikes looked after by pros each day, laundry done by a staff of who-knows-how-many and their every whim catered to….riding the bike these days is the only thing that’s tough! But hindsight is always 20-20 and one can say it’s “the way we never were” in regard to those good ol’ days. One thing’s for sure, it’ll never be the same. I hope that you enjoy reading this as much as I did. Want to add my voice to those saying thanks for a great article. And as someone who dislocated my shoulder coming off my bike about two months ago I have particular sympathy for Adrien Niyonshuti! Thanks for the New Yorker links. The community here, who likes to share information and knowledge is what sets this blog apart from so many others. Thanks again! I’m writing to you from Johannesburg where I regularly see Adrien Niyonshuti race and train with MTN. Thank you for promoting African cycling. Your “I’m seeing the bigger picture” – view of cycling on this blog has been a joy to read. Thanks! Great piece broadening our knowledge if the sport. Thanks… for all the kind words above. Today’s stage was won by South African rider James Tennant, just ahead of Ethiopia’s Msgena Kindeya. Great article, and wonderful to read. Typo: at at -> are at? And to everyone else, if there are typos, happy to fix them.